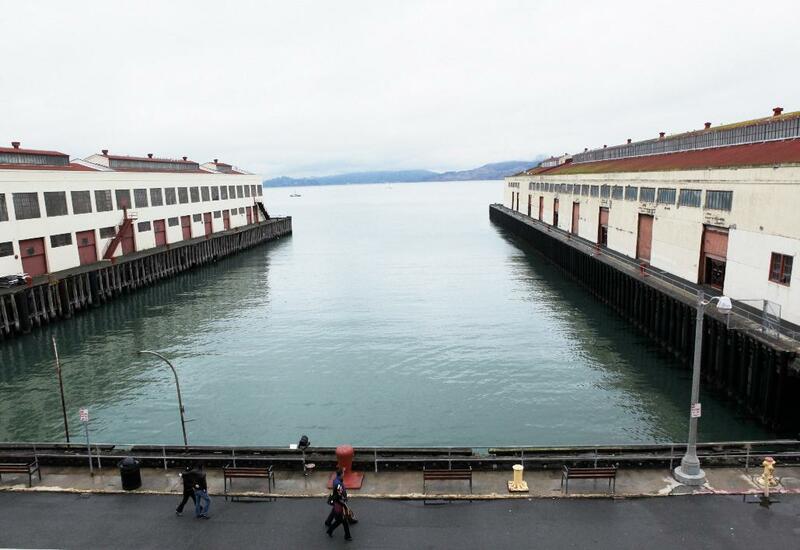 This was our fourth year and we were back at Ft. Mason, the site of the first event, but in a different building. We had a presentation room that seated over a hundred people, a hospitality room with food and drink, commercial exhibits, and four listening rooms. Maybe not quite as dramatic a setting as the last two years, but still right on San Francisco Bay. We needed the additional rooms to accommodate everyone and allow meaningful listening comparisons, but they were expensive and we sure hoped that someone would show up! A handful of volunteers and exhibitors were waiting in the cold. Vladimir, my partner in show biz, arrived with some moving blankets for sound control, nice signs, and the 2010 version of the buttons he makes every year. 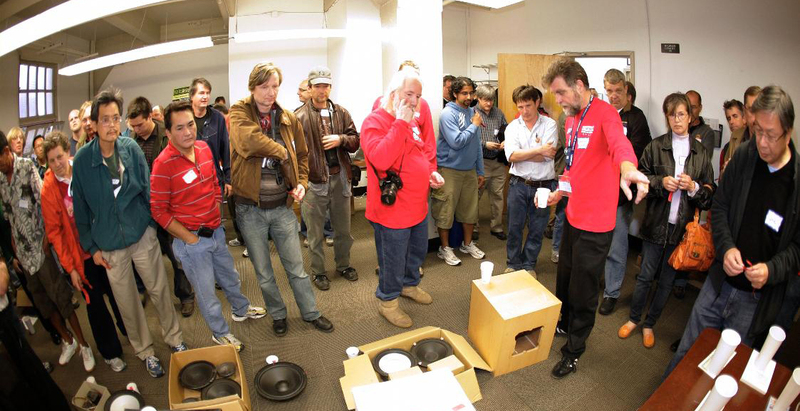 We got the coffee brewing, and more people arrived, filling the demo rooms with their treasured DIY components. Siegfried Linkwitz and Nelson Pass each had a demo room because they were doing presentations this year. In his room Siegfried installed a revised version of his Orion loudspeakers, which had new woofers in a vertical alignment and turned out to sound very good. In fact the Orions sounded the best that I have heard them even though the room didn't have enough sound blankets and was too live. In the Pass room, Nelson, his wife Jill, and son Colin set up a couple of complete systems that he claimed were “inexpensive” which turned out to be pretty much true. 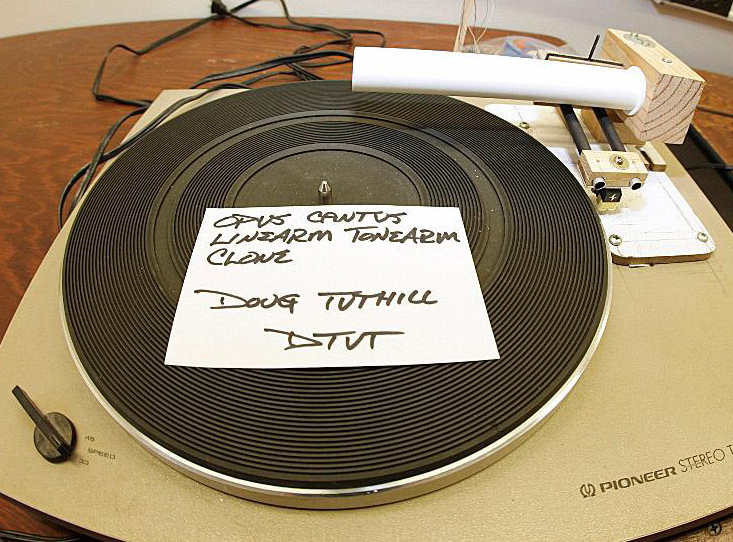 The source was a Sony DVD player he'd picked up at Fry's for $40 and hooked to a passive attenuator. 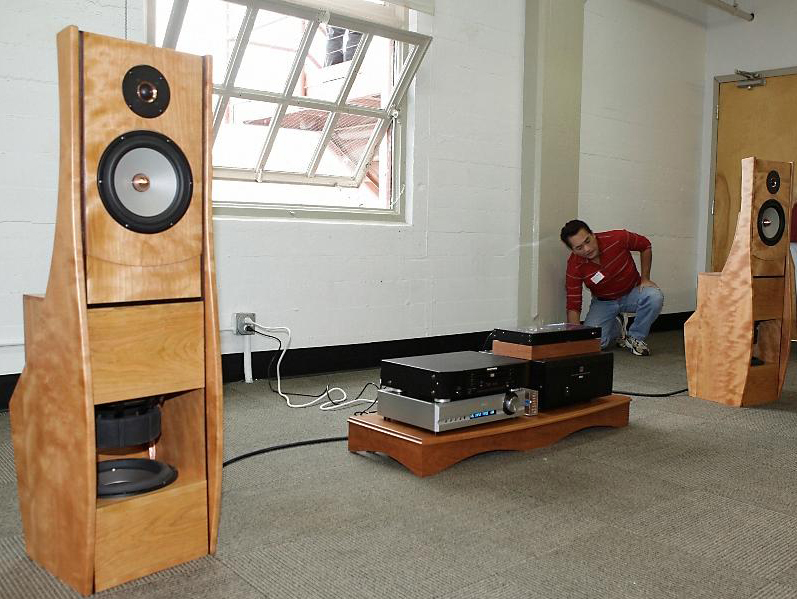 One loudspeaker pair were his standard test setup, the same very large and wide open baffles that he used last year to demonstrate field coil versions of both Lowther and Feastrex drivers. This year they sported Lowther PM6C drivers, which I believe are the cheaper of the Lowthers, and they sounded very good and resolved very fine details while still having great tone. Eminence Beta 15 drivers were used to extend the bass. I didn't find out how the system was crossed over but they had J2 and M2 First Watt amps hooked to them at different times. Maybe someday Nelson will write an article about them. His other open baffles, also made of 3/4” Asian birch ply, were six feet tall by two feet wide with sixteen inch side walls splayed out ten degrees. I've heard people call big box speakers “monkey coffins”, but these would be usable for burying a pretty good sized human. A single Seas 8” full range driver, the Model FA22RCZ, which retails for somewhat over a hundred dollars, was centered in the middle of each. This driver is not only quite a bit cheaper than the original thousand dollar full rangers from Seas which I heard two years ago at RMAF, but to my ear sounded at least as good. They both have a substantial, rich sound. 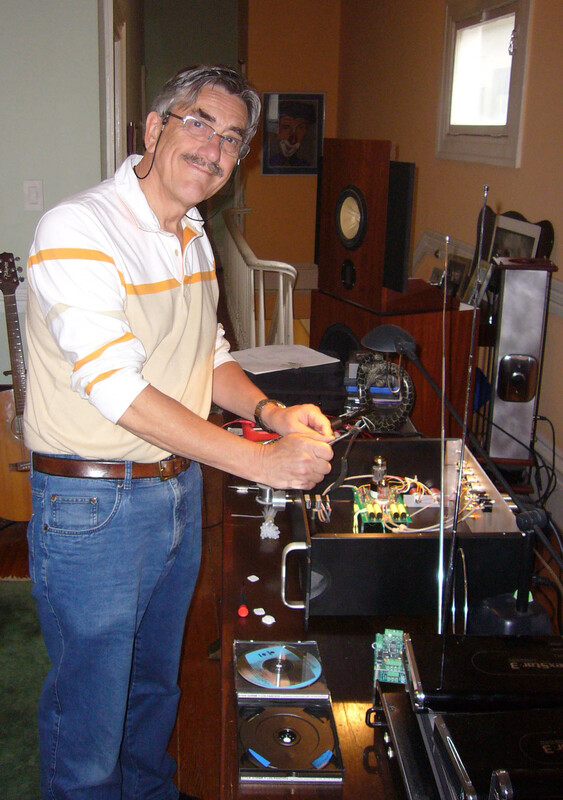 "Papa" Pass told me that for the Seas speakers “I used a First Watt F-2J amplifier and put an RC network in parallel with the drivers to bring the top end down a little. The values were 10uF in series with a 10 ohm resistor to level off the upper frequencies but you can vary this to taste without issues.” I'm pretty sure the network will only work optimally with this model because it's a current amp. 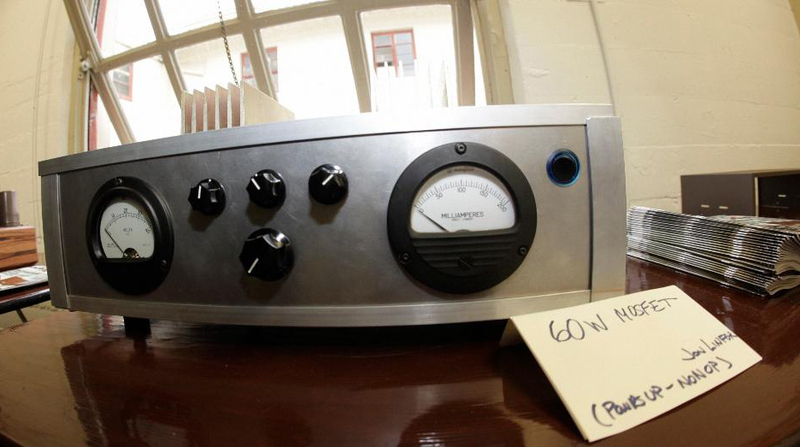 He's published the schematics of most of the First Watt models, including the F-2 and they fit the affordable theme if you DIY them, which of course we have and will! And yes, this system, which sounded so good, would be a quite reasonable option if you make the amp and are single so can have such immense speakers. Of course if you do make them you will probably remain single for a good long time. The listening rooms weren't perfect, but we think with more moving blankets, they will be quite good next year. The two rooms assigned to us regular DIY'ers were really full and not everything got heard. 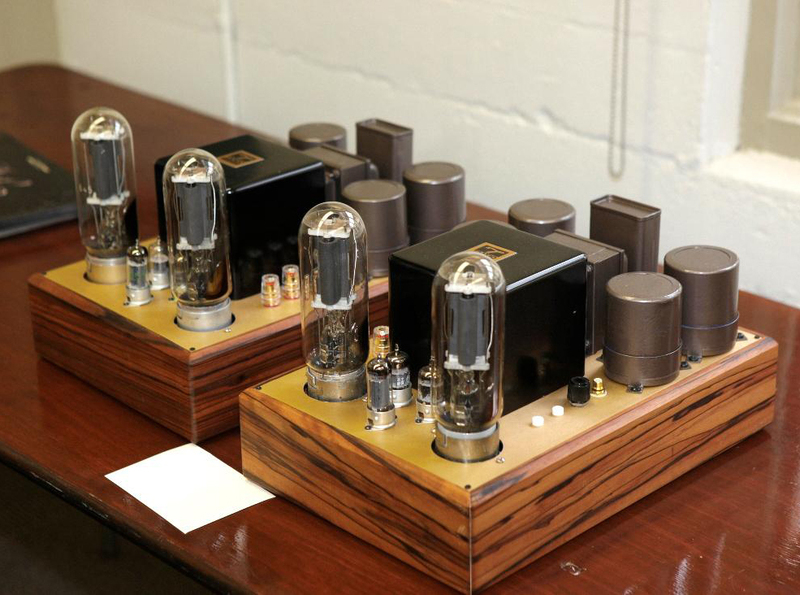 There were various inventive variations on tube amps, turntables, loudspeakers, preamps and solid state amps. Next year we'll use the presentation room to hang out in for food, beer, exhibits and the raffles when there aren't presentations, and there will only be one “distinguished guests” room, which will give us two more rooms for demos. I also want to schedule a time for each room when the people that bring a component will be right there next to it so that you can ask them questions and learn a bit more about the design and construction. The presentations were top notch this year. First up was Mr. 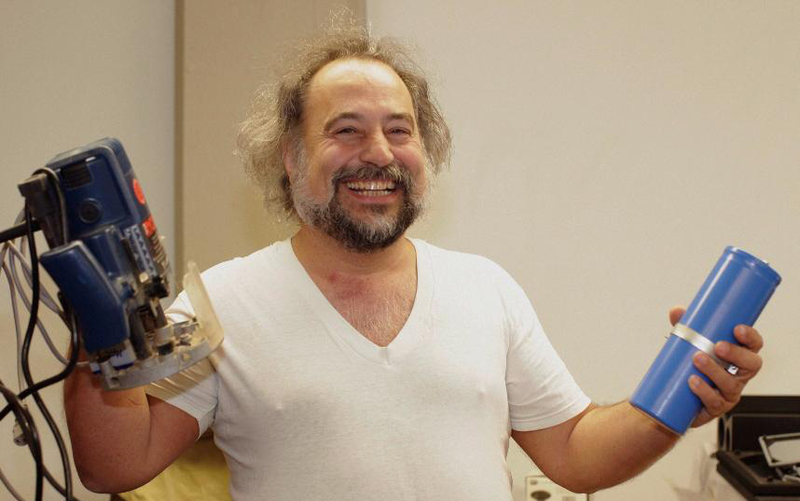 Pass with an explanation of his demo systems, projects in progress, and an in-depth discussion of his new power JFETS. Turns out that he's commissioned a production run of Pass specific devices from SemiSouth at a “six figure cost”. He had lots of curves showing them under different conditions, and the message was that these devices are very very linear. I've heard some of the stock SemiSouth JFETS in amps and they do sound very good, and there is no reason that the Pass variants shouldn't sound even better, being designed for audio use. I felt like laughing sometimes because at last year's show, Nelson's presentation had been very non-technical. Something along the lines of “Our Friend the Power Amp” while discussing the ultra-simple De-Lite amp design that “even a caveman could build”. This time was different. Then we took a lunch break. No barbecued burgers this year, only pizza, but it was good pizza, and fit the geek theme. Next year when “Zen Mod” is our guest from Serbia, we'll have to fire up the charcoal again, because he is famous for his expertise in barbecuing sausages and we'll want to put him to work, at least long enough for a photo op. And beer. We didn't have it due to insurance issues, but next year we'll have that worked out too. I really don't think you can do serious comparisons of audio gear without beer. Later Kirkwood Rough, who had been commissioned by Linear Systems to create the Watt Sucking Fireball #5 amp for this year's show, explained the new circuit and a lot more of more general amplifier stuff that was fascinating. 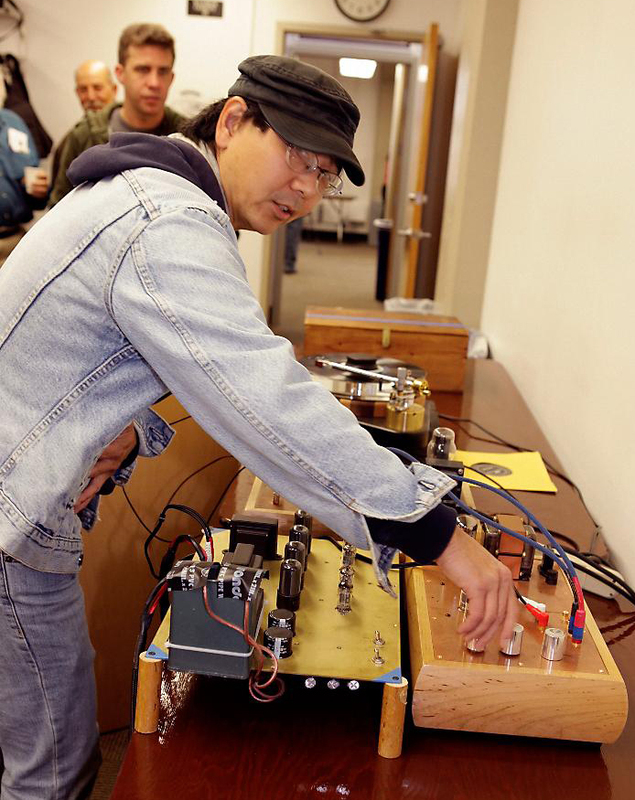 The actual amp wasn't operational, but was on display, and once its working I hope that we can get some circuit boards made for the diyAudio Store. According to Paul Norton from Linear, they are getting decent yields of their P channel JFETS this year which is great news for our crowd because a lot of the projects we want to make need them. They already have a pretty steady supply of the n channel types. I handed out the official red t-shirts that they donated for the volunteers. I finally had a “Staff” shirt like a rock concert bouncer- a lifetime goal of mine. I think Linear Systems still has the black shirts available on their website. 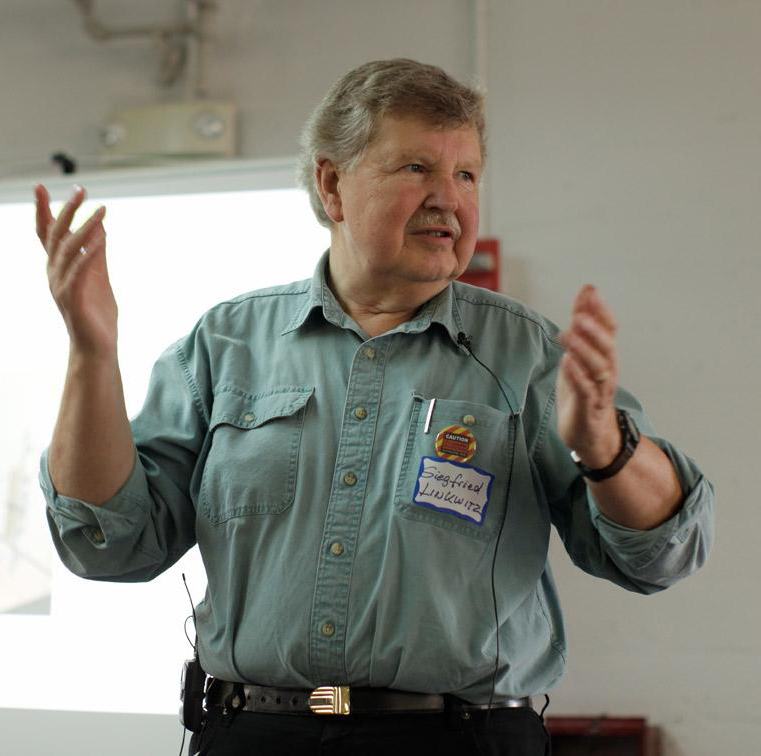 The final presentation was Siegfried Linkwitz, who made enlightened observations about his latest discoveries regarding people's perception of sound, especially related to music. 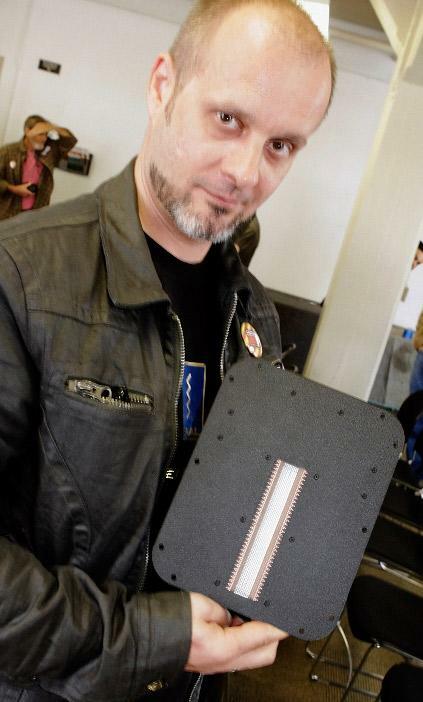 He's observed that certain quite small variations in midrange frequency response can make a big difference in how convincing sound reproduction is and has incorporated these into his speaker designs. He really held the crowd's interest, and afterward there were lots of questions. What a thrill to have the man himself giving us answers! Videos of the talks will soon be available at the burningamp.com site, so go check them out. Happy donor, his closet is empty! 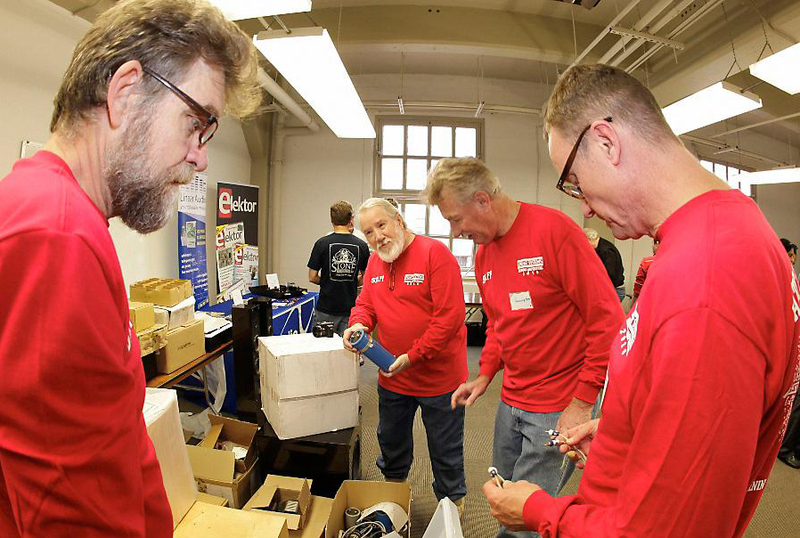 The essential Redshirt Volunteers. Now all that was left were the raffles and auctions. 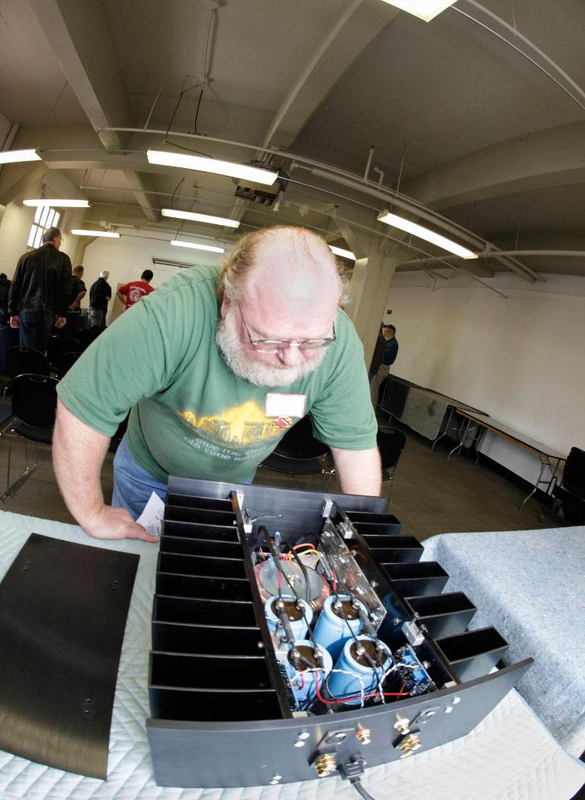 We had lots of donated items to give away including the last of the speaker components that NHT had donated last year. 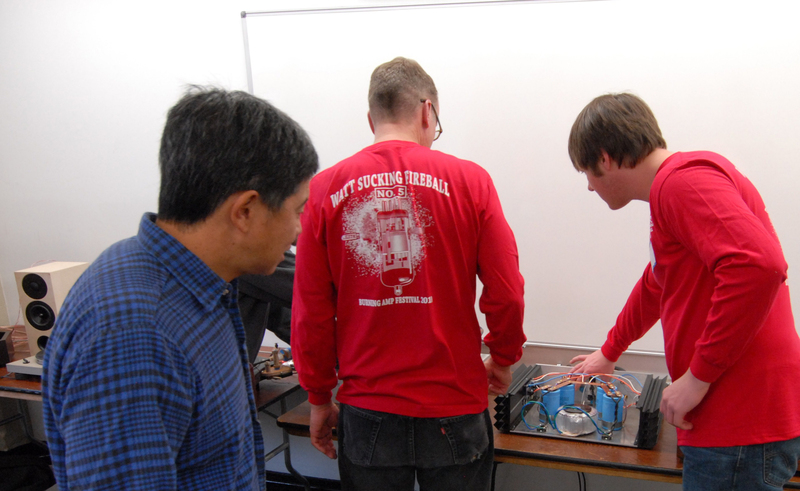 The main prizes were Class D amp modules from Power Physics. I got to be an auctioneer which was a lot of fun, because some items had been donated to benefit the show. Next year we'll do this in the presentation room also, because we need room to lay everything out. By seven in the evening people were tired and started to go home. Attendance was the most ever though, so there will be another show next year on October 1st, 2011 at the same location. The weather should be exceptional then, and we'll now focus on all the stuff we learned this year to make it all the better next time. See you then. 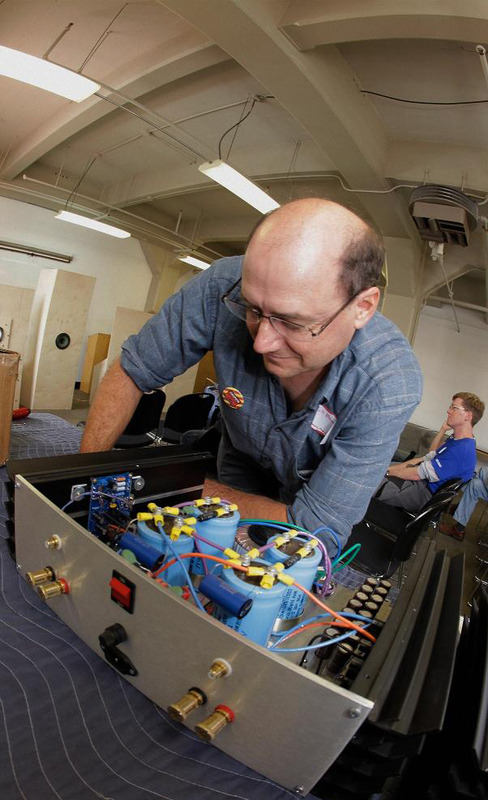 For more coverage, Stereophile Magazine has an article about Burning Amp in their current (February 2011) issue. Last edited by Variac; 1st April 2011 at 11:42 PM. Nice report. I'm the redshirt volunteer in the middle right of the picture showing several of us. 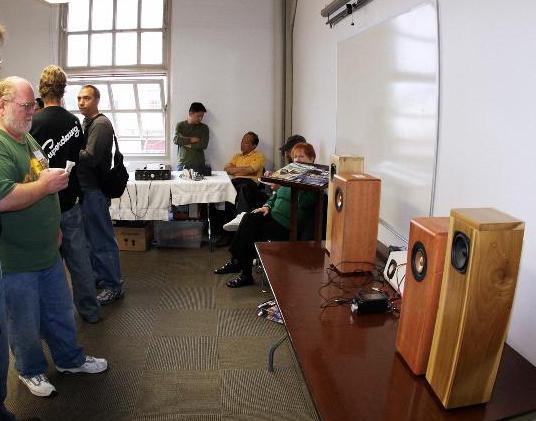 You may recall that I won a class D amp with a ticket given to me by the redshirt in the right foreground of the picture. Can't remember his name. My mind is a steel seive. I would like to give him the amp. If you are the person, or one of you can direct me, I would sure appreciate it. By the way, I recently finished the left half of a pretty good 6A3 A2 amp. Schematic by ElectraPrint. Well, we had one on October 1, 2011, Next year's will probably be at the same place, in October , but the date isn't set yet.